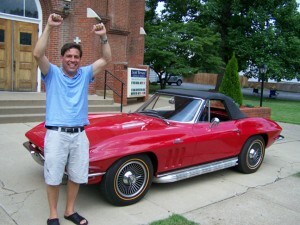 The winner of the 23rd Annual Classic Corvette Giveaway benefiting Saint Bernard Parish and School in Rockport, Indiana drove over 870 miles to claim his prize; a rally red 1965 Corvette Convertible valued at over $75,000.00. Dean Ferdico of New Jersey made the 14-hour drive overnight and arrived in Rockport Sunday afternoon. "I'm shaking," said Ferdico. "I can’t believe this. This car is beautiful." Ferdico's name was drawn at the conclusion of the Saint Bernard Summer Social on Sunday, July 10. Nearly 9,000 tickets were sold for this year’s raffle. People from as far away as Germany and New Zealand purchased tickets. Photos and videos of the winner can be found on the parish website at www.stbernardrockport.org. Saint Bernard parish purchased the car from ProTeam Corvette Sales in Napoleon, Ohio. Tickets will go on sale for the 24th annual Corvette raffle in January, 2012.